Whatever else can be said about it, TDC is about as earnest and heartfelt as a video game can get. It’s an autobiographical think piece based on a couple’s experiences with “faith, hope, and love” during a tragic time in their lives, which touches on many topics that video games have yet to tackle in any serious manner. Sure, most video games are about death in some way (or rather killing), but few consider the brutal implications of the death of a loved one on family members, especially in such an eerily mundane and realistic setting. Regardless of who makes a product, I always appreciate the time, money, energy, and vision it takes to bring all of the pieces together to form a coherent video game, and I assume most critics feel the same way. Even if a game isn’t good, and especially if a game is bad but ambitious, a certain level of respect must be paid to creators in recognition of the sheer challenge of creation. When it comes to TDC, not only do the creators garner the usual level of respect for simply making a product (the game was independently made by a handful of developers with Kickstarter backing) but there is also an enormous layer of extra reverence for the developers making a game about their own tragic personal experiences, which I’m sure is all honest, heartfelt, and carries an emotional weight for them which I will never get close to being able to comprehend in my own life. So it makes sense that TDC is getting so much attention. Its Metacritic is packed to the brim with perfect and near perfect scores, and no professional critic has given the game a lower score than 50/100. It was a top seller on Steam for a while, and it has been nominated for multiple Independent Games Festival awards. It’s different. It’s profound. It’s tender, and about things which video games just aren’t ever about. TDC is important. Because of all of the above, I approached TDC with an arguably excessive level of skepticism. I’m a firm proponent of “output-based” evaluation, as opposed to any labor-based theory of value. That is, I think any creation, whether it be a work of art or a more utilitarian product, should be judged based on its quality as a finished product, with no consideration given to the factors which led to the creation of the product. In other words, I don’t think the real life struggles of TDC’s creators should color critical evaluations of the game. And after playing through TDC in two hours… I’m pretty sure they did for a lot of players and critics. The game simply isn’t good. 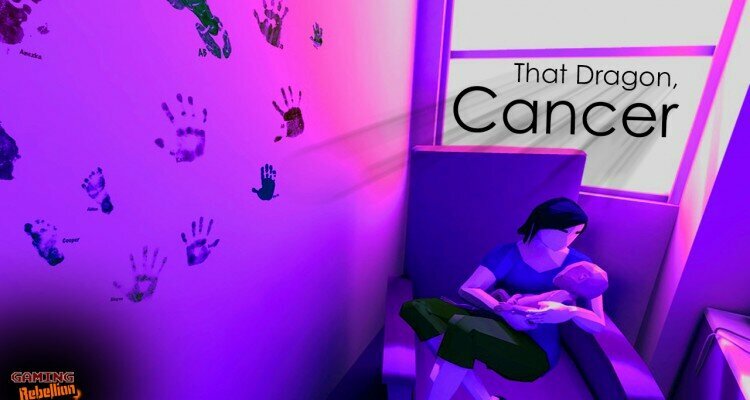 That Dragon, Cancer tells the story of Ryan and Amy Green as their one-year-old son, Joel, is diagnosed with cancer and subsequently perseveres against all odds by surviving for four years until his parents accept that there is no cure or long-term treatment for his disease, and allow Joel to die. Ryan and Amy deal with the roller coaster of hope and preemptive grief, they have marriage troubles, they doubt their faith, they struggle to raise their other son, and through the hellish turmoil of spending years with the constant threat of death of a child always around the corner, they finally arrive at some modicum of peace as they accept his end. All of this is presented through highly abstract metaphors and constant, equally abstract, character-perspective shifts. Also, Joel is mentally challenged. I know that TDC is autobiographical, and I know that the story holds profound importance to all those involved in the actual events, and I’m sure making the game was a cathartic experience for them, and the final product stands as an important reminder of their trials and tribulations for all eternity, but still, TDC is all of that a bit… schmaltzy. It’s a game about death, but not just ordinary death. It’s about death via the particularly excruciating degradation of cancer. Suffering from cancer is always horrible and tragic. But it’s not just some regular guy in his mid-50s who gets the cancer and horribly suffers, it’s a kid. That’s extra tragic. Children are innocent and deserve a chance to grow up and live their lives. Plus it’s not just a kid, it’s a barely-functional mentally challenged kid. The innocence and tragedy levels are off the charts! If That Dragon, Cancer was a movie, it would either be a November-released Oscar-bait drama, or a Hallmark/Lifetime Channel original. And like the movies in those categories, TDC is about profound ideas but never pushes them forward in any meaningful way. It substitutes their mere presence for substantive commentary. It has sick children, cancer, mental disabilities, “faith, hope and love,” and a million important other themes which convey an impressive measure of importance, but… it doesn’t really do anything with them. You know how a lot of action movies are about the hero trying to rescue his child/girlfriend/wife or some other innocent and vulnerable person from the bad guys? This works because just about everyone can relate to the inherent importance of a loved one, so rather than waste screen time on characterization, the action movie just uses “daughter” or something as a signifier for emotional value. I think TDC does the same thing. Except TDC isn’t a junky action movie which only needs to serve up a skeletal story to carry the action beats which the audience is really there to see. Rather TDC is about the profound struggles of a husband and wife dealing with “faith, hope, and love” as their son slowly dies of a terrible disease. So it would be nice if that son at the center of the story was, well, an actual character. But Joel really isn’t a character. Joel is a blank slate stand-in for every heart string-plucking characteristic a person can possible contain. He has no personality, no quirks, and he doesn’t even talk. The game simply takes it for granted that the player will care about Joel because, well, he’s related to the player-characters, he’s young, he’s mentally challenged, he’s suffering, and he’s dying. And I may be going to hell just for saying this, but in a purely narrative sense, Joel’s mental disability is a serious hindrance to the story. I get that kids are young and by nature have under-developed personalities, but they still typically have some characteristics which differentiate them from other children. Joel doesn’t really have that. He just eats, laughs, and cries. 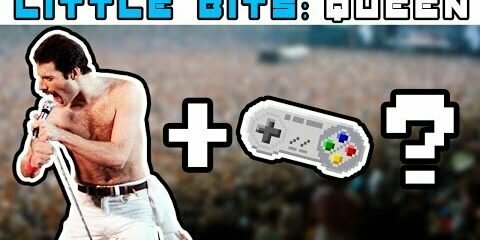 Obviously that isn’t Joel’s fault, and again, I’m sure that the specific way Joel ate, laughed, and cried is meaningful to the real life Ryan and Amy Green, but to some random player like myself, Joel is simply lacking character and therefore I don’t see any particular reason to care about him in the game. TDC’s problems of characterization are also greatly amplified by one shockingly bad visual design decision. Aesthetically, the visuals in TDC are solid for the most part, with plenty of nice color contrasts mixed with soft lighting effects to offset the otherwise cheap visuals and robotic animations. But for the life of me I cannot comprehend why they decided to use a creepy faceless design for the character models. Seriously, Ryan, Amy, and especially poor Joel look like Silent Hill monsters. In most visual stories it’s a character’s face which conveys the vast majority of his or her personality, and removing facial characteristics (especially the entire face) only serves to make characters look grim and lifeless. I know TDC was working on a limited technical budget, but the visual effect is so off-putting and jarring that there is no plausible excuse for omitting proper character models. 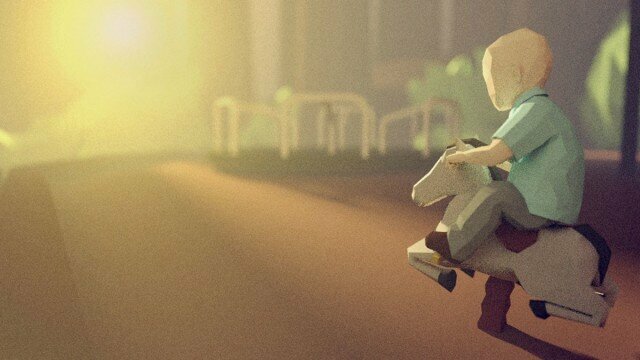 Even if Joel was an interesting character and I cared about his plight, or if the narrative had pushed Joel into the role of a background McGuffin, focusing exclusively on the far more sympathetic struggles of Ryan and Amy, That Dragon, Cancer still wouldn’t work because there is no reason for its story to be made into a game. In my analysis of Everybody’s Gone to the Rapture, I asked why the story told within the game worked better as a video game than it would have as a novel, movie, or tv show. What did the interactivity of the video game medium add to the narrative? Did it help the audience empathize with the characters more, understand the plot better, or more vividly experience the drama? I don’t think Rapture’s gameplay did any of those things, and therefore didn’t warrant being made into a video game. That’s not to say that Rapture’s story was bad or uninteresting (I actually liked it a lot), only that it would be served better through a non-interactive medium, since the tidbits of interactivity offered in the game hindered the user experience rather than enhance it. TDC suffers from the same exact problem. As far as I can tell, the only reason the story of TDC was made into a video game was because Ryan Green was a game developer and I guess he felt comfortable working with the material in a medium he knew. That’s understandable, but it doesn’t change the fact that conveying the pain of parents dealing with the slow death of a child in this context doesn’t work well in the format of a video game. It’s just not a story which can be fitted to video game mechanics, or that can be presented in any coherent manner within the parameters of a game. Given the lack of obvious mechanics that can be formatted to TDC’s story, the developers opted to strip player input down to less than the bare essentials. TDC is not even a “walking simulator,” it’s a “point and click interaction” game. So unlike Rapture or Gone Home, the player doesn’t even get to walk around his environments. But unlike the classic “point and click interaction” games like Myst or Monkey Island, there are no puzzles or even environmental continuity. Instead, TDC constantly carries the player between small set pieces which typically require the player to do nothing more than click-walk himself down a path and then click-observe some item of interest to trigger the next story beat. At most, TDC occasionally offers mini-games, but without lose states or any challenge whatsoever, they barely feel different from the “point and click interactions” of the rest of the game. To be clear, I’m fine with a game using a minimal mechanical interface to tell a story as long as the mechanics serve to amplify the story. The simple puzzles and item examinations in Gone Home linked the player and the main character as they tried to figure out what happened to the Greenbriar family over the previous year. Simply walking through the levels in The Beginner’s Guide lets the player understand the evolution of Coda’s designs and how Davey corrupted/misinterpreted them. Unfortunately, TDC’s mechanics are so minimal that they feel pointless. They neither alter the narrative nor enhance the player’s connection to it. They simply exist to make sure the player is still present. They add nothing of value to the experience. There is no reason TDC’s story should have been a game (at least in this form) rather than a book or movie. It doesn’t help that the set pieces are mostly confusingly designed, overly abstract, and actually detracted from my ability to understand what happened in the real life story of Joel Green. I guess it’s difficult to tell the straightforward story of a child going through endless rounds of bad diagnoses and unsuccessful treatments, so much of the game consist of highly metaphorical portrayals of… I guess Ryan and Amy’s feelings. Although sometimes an approximation of Joel’s perspective. But also sometimes multiple character perspectives. I don’t know, it’s all very strange. Throughout the entire game I felt like I needed some sort of developer glossary to keep the metaphors clear. Sometimes the metaphors are pretty straight forward. As Joel manages to outlive his initial projected timeline and undergoes more and more treatments, Ryan and Amy are in the constant grip of anxiety, so the game portrays them in the middle of a choppy sea. Amy takes solace in her faith and truly believes that her son will eventually be cured, so she sits in a life boat. But Ryan has a crisis of faith, wallows in depression and dread, and therefore struggles to stay afloat all alone in the water. Ok, I get all of that. But then there are a lot of other parts of the game which really push the limits of comprehension and coherency. In one scene the player perspective switches to an unknown entity which enters the “Temple of Man,” a sort of circular stone pantheon, at the center of which is Ethan on a bed hooked up to a sleek medical machine. A tv next to Joel turns on to reveal some eerie brain scan images intercut with out of place bright colors. For the first time in the game, Joel speaks (though it’s established that he can’t speak due to his disability, so this isn’t really Joel speaking). He says, “Hey, it’s you again. I love you. You’re my friend.” Suddenly Joel is standing on the table and holding a large purple ball. He says, “This is my favorite game. Do you wanna see? Watch, I’ll start it.” The ball turns white. Joel releases the ball and it flies around the room like a balloon losing air until it gets to the size of an apple and freezes. Joel claps and laughs as the ball turns yellow. After some more non-sequiturs from Joel and a randomly appearing lion, the player is transported to outer space and starts some minigame that consists of playing around with constellations. I couldn’t actually figure out what I was supposed to do at this part, but a few minutes later, the screen fades to black and it’s on to the next scene. Pardon my lack of metaphoric analytical skills, but I have no idea what the hell that scene was about. Maybe it meant something special to Ryan and Amy Green, but to me, a random player trying to follow a story and connect with characters I don’t personally know, the “Temple of Man” and a whole host of scenes like it come off as nonsense. And pretentious nonsense at that. 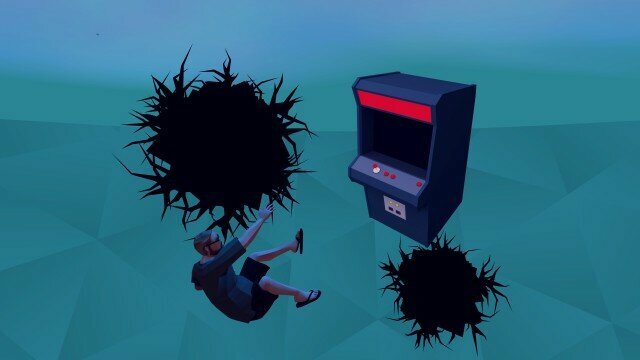 Ironically, what I find to be the single most interesting component of That Dragon, Cancer is probably going to be the game’s single biggest detriment to most players. TDC is a Christian game. I don’t just mean that TDC was made by Christians or has Christian themes (though both are true). I mean that TDC is ultimately about the importance and validity of Christianity in life. Ryan and Amy discuss the role of faith in their lives, they ponder the meaning of Bible verses, and the game ends with the player trying to keep flames lit within a church even as they keep dying out (which I think is a metaphor for Ryan and Amy trying to maintain faith against adversity) followed by Joel’s implied death and then a glimpse at Joel enjoying paradise in heaven. The ultimate, though not quite explicit message of the game is to always have faith in God because he can always provide salvation in the end. Yes, That Dragon, Cancer actually goes there. The game’s Christian themes aren’t mentioned in any of the game’s marketing as far as I can tell (unless a single use of the word “faith” on the Steam page counts), but they’re at the core of the game’s narrative and meaning. The Christianity sort of comes out of nowhere in the game itself, with only tangential references for most of the game until it dominates the final third of the story. One Steam reviewer called it a “bait-and-switch” and even though I wouldn’t go that far, I kind of see where he’s coming from. Despite my own personal aversion to Christianity, I admire the developers for being so explicit about their views. 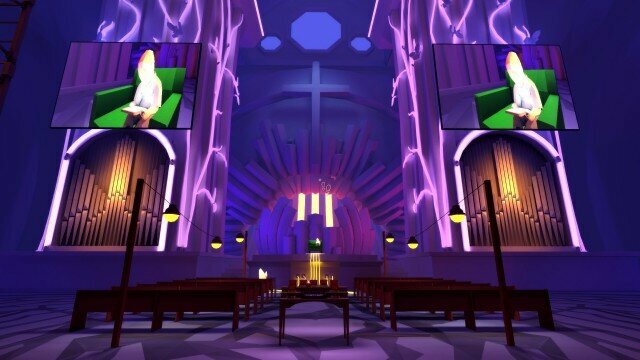 Organized religion is not very popular amongst the primarily young, male, wealthy, techno-centric demographic which tends to play expensive indie games on Steam, and as such it would have been a hell of a lot easier for Ryan and Amy Green to tone down the religious aspects of the story for the sake of popular appeal. But clearly Christianity is extremely important to Ryan and Amy, and crucial to Joel’s story, so they reflected that in the game. So I respect the two of them immensely for making an unpopular and principled moral stand. On the other hand, the Christian elements just make the story all the hokier. Take away the pretensions of Christianity, and the game’s ultimate message feels like a cop out. Rather than come to any real terms with the huge topics Ryan and Amy tackle in TDC, like when to cease low-yield treatments to keep their suffering son alive or how to help their other son understand the horrors Joel is going through, they instead opt for some combination of God is all loving/God works in mysterious ways as their ultimate catharsis. Earlier I said that if TDC were a movie, it would be an Oscar baity drama or a Lifetime/Hallmark Original, but during the last third of the game when the religious elements kick into full gear, TDC veers dangerously close to Fireproof and War Room territory. So, I wasn’t a fan of That Dragon, Cancer. Purely as a game, I thought it was quite bad. Again, that isn’t to say the real life story the game is based on isn’t interesting, inspiring, or important, but it clearly should not have been told through the medium of video games. Or at the very least, it should not have been told through the form of this particular video game, and especially not at an absurd $15 price tag. Given the minimal mechanics, obtuse metaphors, short run time (less than two hours), and high price, I’d recommend that anyone out there who really wants to see what TDC is all about should watch one of the game’s many walkthroughs or Let’s Plays on youtube, rather than purchase the lackluster product.